The Range combines comfort and ultimate safety with the new MIPS tech that moves with you on potential impact. Offering one of the best fits you're likely to ever experience with a ski or snowboard helmet, the Giro Range MIPS Helmet features Conform Fit technology, which precisely wraps your head with its two-piece articulating shell. This innovative technology redefines the experience of skiing and riding with a helmet, making it seem like a mere extension of your body instead of some bulky object awkwardly tethered to your head. MIPS technology makes the Range an excellent choice for the aggressive skier and rider putting it all on the line. 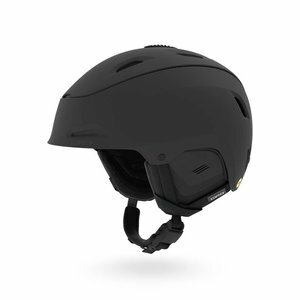 Standing for Multi-Directional Impact Protection System, MIPS helmets feature an elastomeric attachment system along the liner, which creates a slip plane in the event of an angled impact. This slip plane allows the helmet's shell to rotate independently around your head, subsequently reducing rotational forces before they're transferred through the helmet. You'll love the Thermostat Control Dial if you've ever wanted to stay cool on warm spring days or prevent drafts of chilly air on frigid powder days. This sliding knob controls the ventilation system, adjusting its airflow to match the conditions on the mountain. Stack Vents located over the goggles channel warm, moisture-laden air to keep your goggles free of foggy build-up, especially on those stormy days. Giro didn't stop there, it also integrated a GoPro mount along the upper brim for a better point of view. The helmet is finished with an X-Static liner boasting anti-stink properties, so your favorite helmet doesn't start to smell less than favorable.